Going to hospital can be a rather daunting prospect for some. It needn’t be. In keeping with our goal of providing superior quality medical care, we also wish to make your stay with us as stress-free and comfortable as possible. Here are a few tips on what to expect and what to do to make your stay that much easier. To help you become more familiar with hospital procedures, prior to the day of your admission we will invite you to meet with an admission officer who will explain all you need to know, arrange a fixed date for your hospitalisation, explain our financial protocols and give you a complimentary copy of this detailed brochure. You will be required to complete and sign a consent form for admission. If you are undergoing surgery, during the pre-admission process you will be asked to pay a deposit so that we can reserve the operating theatre. 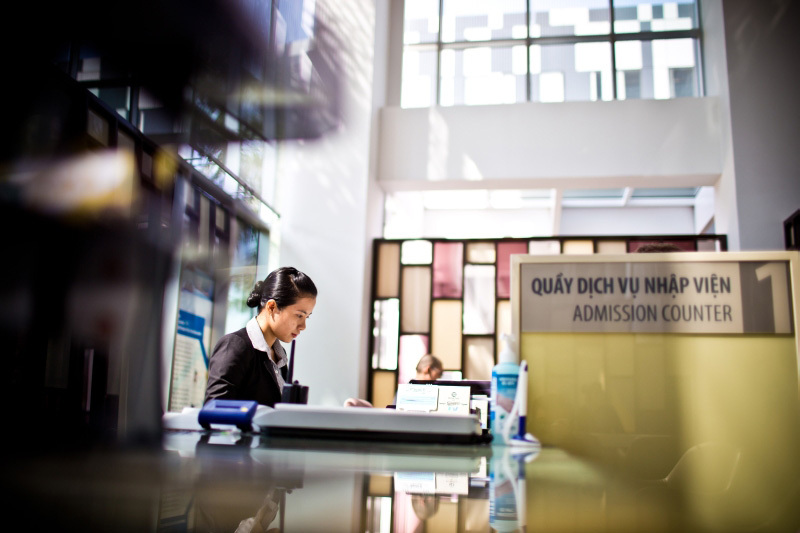 At admission, we provide patients with the following documents: an appointment card for your admission, this brochure “Your stay at FV” and 3 leaflets: Hospital Visiting Times, Patient Rights and Responsibilities, and Identification of Hospitalized Patients. The admission process itself is quite simple. Upon arrival, go straight to the admission office in the lobby to check in (please remember to bring your appointment card with you). The admission officer will instruct you on how to complete the deposit process at the nearby cashier counter. All relevant details regarding your hospitalisation will already be on file (having been forwarded from the pre-admission meeting). An attendant will then accompany you to the ward and introduce you to your nurse. Your nurse will then take you to your assigned room and help you to settle in. If you wish to change your choice of room during your stay, please inform your nurse, who will look into your request. Rooms are subject to availability. Some patients may require isolation in a single room for medical reasons. If so, this will incur an additional charge which will be explained to you at the time. Now for the little details: what to bring from home, what we supply, what not to bring. Nightshirt or pyjamas. If you prefer, you may bring your own sleepwear. All bed linen and towels required during your stay. Slippers, soap, shampoo, toothbrush, toothpaste, hairbrush, etc. All of your current medications and prescriptions to present to your physician. Please do not take any medications of your own during your stay unless approved by your doctor and made known to your nurse. All X-rays, scans and other test results related to your condition (including those performed at other hospitals). Enough money to cover your deposit (please ask the admission officer for the correct amount). A familiar toy or stuffed animal to comfort the child (please note that noisy toys are not suitable). Books, drawing books, laptop, Ipad, etc., as entertainment. Milk or formula, if bottle feeding (milk is available at an extra charge). FV Hospital cannot take responsibility for any items not locked in the department safe during your hospitalisation. Please leave your valuables at home or give them to your family or friends to take care of. If you need to put something in the department safe, please alert your nurse upon admission. If you wish to delay or cancel your appointed hospitalisation at FV Hospital, we require that you notify us at least two working days prior to your scheduled admission. Cancellation notifications must be made directly to the admission officer, at (028) 54 11 35 28, between 7:00 am and 5:30 pm, Monday through Friday. If you wish to call on weekend or after working hours to cancel an admission which is planned on Monday or the day after, you can call our Accident & Emergency service at (028) 54 11 35 00.